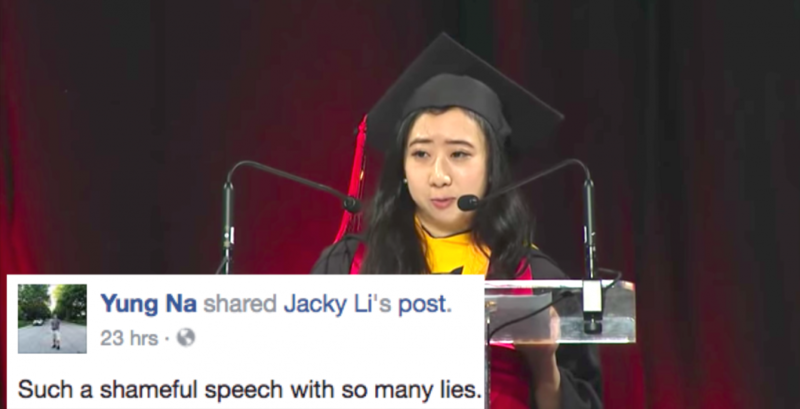 A Chinese student has been harassed and hounded off social media for making a commencement speech that criticized China. 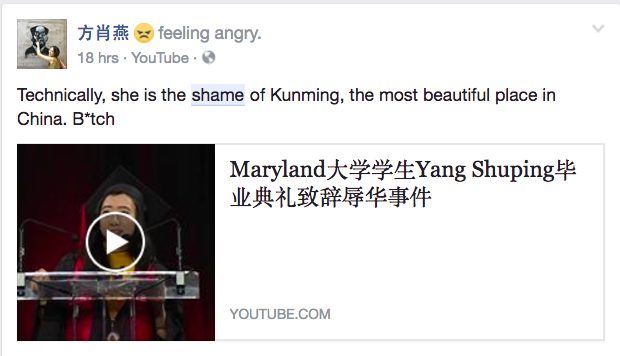 Shuping Yang graduated from the University of Maryland and delivered a speech praising the democratic values of the US in comparison to China. Her talk was met with violent responses from other Chinese students, accusing her of “licking the boots of white people” and “bringing shame” on her homeland. Chinese students hit back with vitriol. The main contention with her speech seems to be that while air pollution in China is an issue, the statements she used to make her case are not factually accurate. A recent New York Times article has prompted discussion about the behavior of Chinese student groups on American campuses. The article alleges groups such as the Chinese Students and Scholars Association pressure students who do not take a pro-China stance. After The Tab noticed criticism of Shuping Yang’s speech, we reached out to Mary Wu, the Secretary General of the University of Maryland Chinese Students and Scholars Association. She said she took issue with the detail of Shuping’s speech. Wu told us Shuping’s speech, particularly her tone, was “not appropriate given the occasion.” The University of Maryland currently has between 3000 and 4000 international students from China, she said, and many did not appreciate hearing unwarranted and unbalanced criticisms of China during what should have been a once-in-a-lifetime moment of celebration. 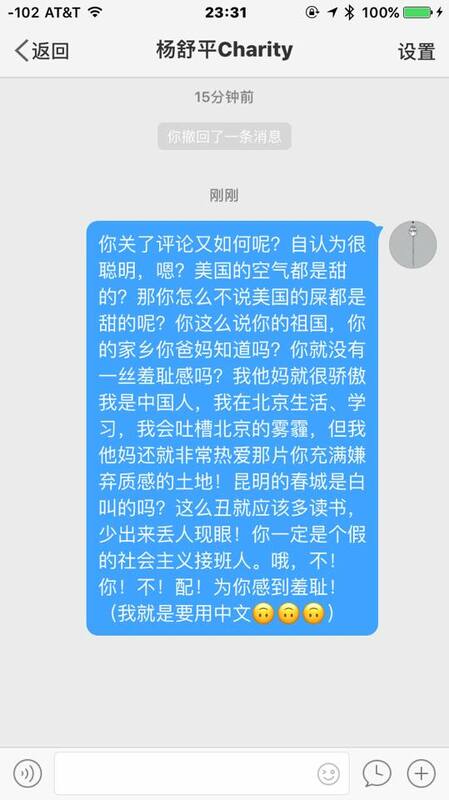 Yang Shuping's stupid speech has been spread widely via media in China. Now I believe that UMD is a stupid place and made a stupid choice. 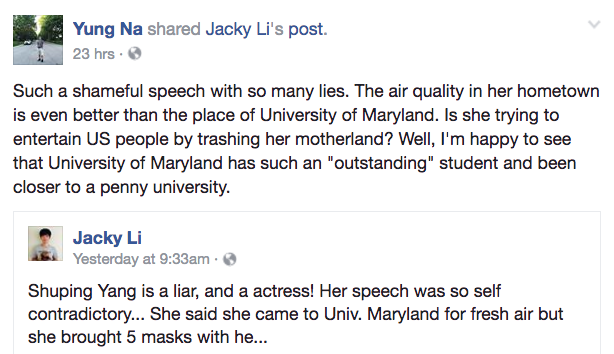 “UMD has not given a clear answer about the extent of its involvement in the crafting of this speech, or any intentions in choosing a script like this,” Wu said. She emphasized in an interview that Kunming, Shuping’s hometown, is one of the most environmentally clean cities in China. The air quality in Kunming, she told us (adding that the city is one of the most popular tourist destinations in China) is comparable to much of the United States. “We agree that there are environmental problems in China as in everywhere else, but Shuping’s statements constitute an exaggeration and are not objective truths,” Wu said. “The University believes that to be an informed global citizen it is critical to hear different viewpoints, to embrace diversity, and demonstrate tolerance when faced with views with which we may disagree. Listening to and respectfully engaging with those whom we disagree are essential skills, both within university walls and beyond. Wu said she and many of her peers found this statement unsatisfying. She added as a result of these events, CSSA and other groups have started a social media campaign called “I am proud of China,” where students can discuss their positive experiences in their home country. “We respect Shuping’s speech, but we don’t agree with it and we will civilly present the other side of the story,” she said. Other social media posts, however, took a more aggressive tone. A few Chinese citizens even came forward and identified themselves as high school classmates of Shuping, claimed she has always longed to immigrate and stay permanently in the United States. 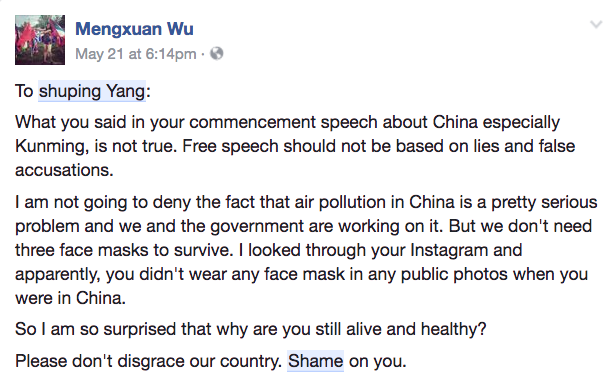 With the emergence of these posts, however, Mary Wu strongly encouraged those online to halt their personal attacks on Shuping. Shuping Yang , you are totally a liar! Have you ever been to Kunming? Are you a local ? I really wanna know how could you live with 5 masks. “I want to tell everyone to stop wasting time attacking this girl. She just made a mistake. We should be asking for a response from the university and presenting our perspectives respectfully,” she said. Wu added that if not handled well, UMD’s recruitment of Chinese international students could be impacted next year. UMD has a good reputation in China, she said, which could change with this incident. International students, ineligible for financial aid, generally pay over $31,000 in tuition and $15,000 in room and board per year. Though Wu does not know Shuping personally, she stated she among others have tried to reach out to her repeatedly over the past few days. Wu said she would like to help her during what must be a difficult time. “This is beyond what she can handle, and part of what we are trying to do is to help her,” Wu told us. But Shuping has not responded to any texts and seems to have deleted her social media accounts. She has not responded to a request for comment from The Tab. With additional reporting by Jessica Li.